New functionality, fresh rich content and 3rd party services are creating new performance issues while application development, testing, and release to production cycles are at an accelerating pace. In the midst of these demands, new technologies such as Mobile, Virtualization and Cloud are complicating the environments in which applications are delivered. 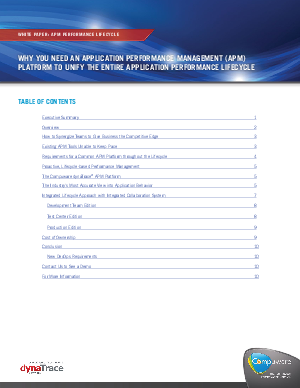 The new application performance management best practice is to unify all of the teams involved throughout the application lifecycle by providing a common set of information that is both instantaneous and actionable. This means connecting the Development, Test, Production and Business teams together through information that serves as a ‘lingua franca’ (really, a way to break down silos) about application performance issues. Each team, in a complete application lifecycle solution, receives performance information that is relevant to their role and can be used to fix problems immediately, when they occur.